Does this picture remind you of the default Windows XP desktop background? That's what most of Mongolia looks like. 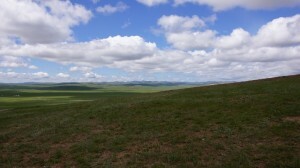 Roughly 40% of the Mongolians live in Ulaanbaartar (UB). The rest are sparsely scattered in thinly populated communities in the vast open terrain. The cultures vary across the desert, meadows, and hills. The human to animal ratio is 1:12. The seasonal dwelling is decided on the animals' needs (Mongolia). Mr. Terbish and I wandered in Bogd National Park, when he explained some of the characteristics of Mongolian nomadic people. Terbish is a member of the the National Disaster Management Committee representing his mobile company: Unitel. His father in-law is a Herder living 300Km west of UB. Father in-law has to search for a cellular signal, like ride the horse to a coverage area to speak with Terbish; then schedule a reconnecting time if a reply is to follow. In the country-side they don't have FM Radio either. 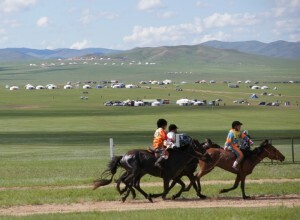 To give you an idea of the coverage, mobile operators had setup temporary base stations to give connectivity to the crowds at the Naadam horse races. The horse races took place in the plains about a 2 hour bus ride from UB with a strait race track spanning 25 kilometers. RIMES project had pilot tested a community-based warning system with motorcycles and horse-messengers to carry the hazard information to the last-mile communities. In the "hazInfo project" simulations we conducted in Sri Lanka, several communities mounted public addressing systems on the hood of three-wheelers (Tuk-Tuks) to relay the message to the village households. It seemed to work well during the simulations but the efficiencies are questionable during a real event as to whether the communities can organize a three-wheeler and a PA system in short notice. Besides earthquakes, all other hazards in Mongolia are hydro-meteorological that are slow onset giving enough time to respond. I was thinking addressable satellite radios but they are not two-way communication devices. HF radios for data transmission may be another way to bridge the last-mile? These observations were made during the "ITU Asia-Pacific Regional Multi-stakeholder Forum on Emergency Telecommunications", which was held at Chinggis Kaan Hotel, Ulaanbaatar, Mongolia, 08-11 July, 2011. I presented on our experiences with the Common Alerting Protocol and also submitted a supplement brief that recommends member states to register alerting authorities.